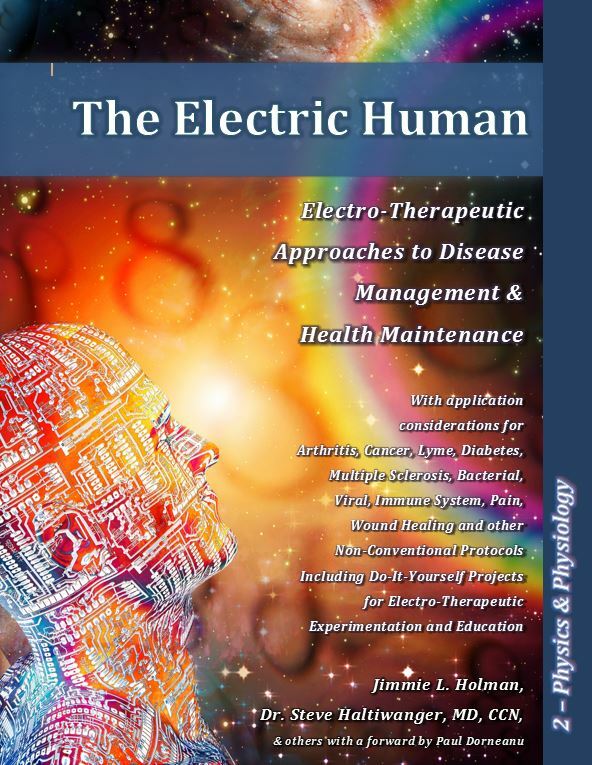 Jimmie Holman and Dr. Steve Haltiwanger describe in both technical and layman terms the underlying electrical, chemical and energetic processes of and the relationship to biological operation and wellness. An emphasis is placed on making these sometimes abstract concepts easy to understand from any perspective, be it scientist, doctor, patient, or student. An understanding of these basic concepts will allow the user to better strategize and utilize these emerging and developing concepts and technologies for effective personal use. Disclaimer: These pages are for informational and educational use only. The devices, methods, and suggestions discussed in these pages are meant as a primer to this technology, to allow you the first-hand experience and self-education so that you may also personally validate the science underlying this and similar technologies and hopefully add your discoveries to the shared pool of knowledge. No health or medicinal claims are made. No guarantees of ANY KIND are suggested. Use of these type of technologies as a treatment should not be utilized as a substitute for competent medical care. Our focus is to provide some basic guidelines for experimenters and researchers who may otherwise endanger themselves as they probe the possibilities of this emerging technology and whatever it may offer them. Section 2 of the Electric Human is planned to be the most technical section by far … unfortunately that also means slower and more researched/referenced articles. Each of the listed article headings are areas already identified as needed. If in bold, they are already available. In “thin” type, have not been yet uploaded. In some cases, we are waiting on copyright issues, or still adding appropriate information. The Electric Human was originally intended as a sale-able, hardcopy, published physical book and e-book. Section 2 specifically was actually holding up ANY sharing of info. The volume of information we had already collected and created had already reached an “unprintable” size. We understand this content is terribly important to MANY people regardless of their personal use and for that reason we decided to make ALL the content freely available. At least some of the informative content of section 2 is covered in lighter (easier to understand) in sections 3 and 4. This was to make the most pertinent info available to the most people in the shortest amount of time. However, if there ARE special areas of interest in section 2 you would like us to focus on, please feel free to suggest and we will normally be able to share what we have. The beauty of this electronic format is that it is dynamic and can change and refocus as times, people and needs do. Thank YOU for providing the seed for this explanation which was really needed!